There can be many roadblocks to start beekeeping, especially for wannabe apiarists in urban areas. Perhaps you live in an apartment without a yard, or maybe your neighbors are not compelled by the plight of pollinators and refuse to accept having hives buzzing nearby. Maybe your local zoning ordinances do not allow backyard beekeeping at all. In some cities around the country, community apiaries are making a safe and supportive place for urban beekeepers to raise their bees with fellow bee enthusiasts. Community apiaries offer beekeepers a space to keep their hives in a centralized location with other beekeepers and their hives. Depending on the program, the community apiary may offer hive management support or training, but beekeepers are required to bring their own bees, hives and equipment. Community apiaries can be found in all different locations, from garden centers to corporate campuses. 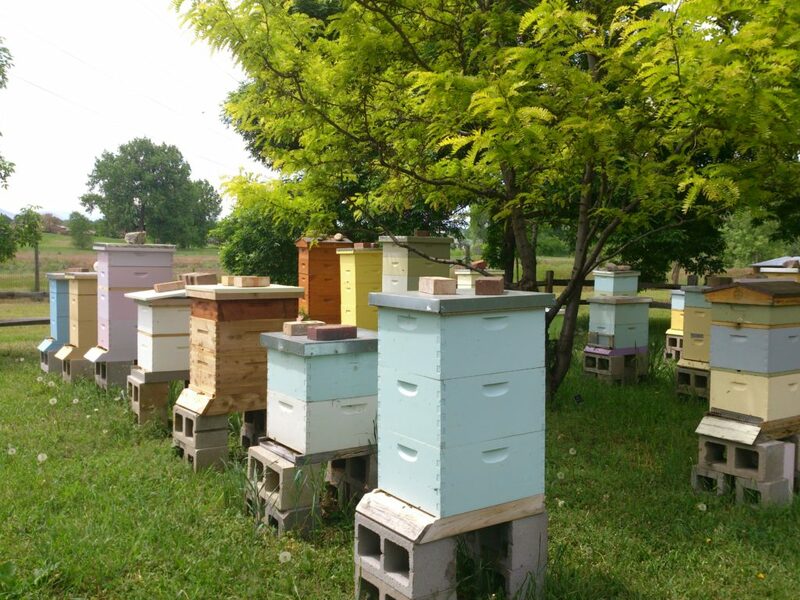 Some community apiaries are run by non-profits like Burgh Bees in Pittsburgh, Pennsylvania. According to Pattinson, the past president of Burgh’s Bees worked extensively the city of Pittsburgh to develop a progressive urban agricultural legislation about four years ago. When Burgh Bees started in 2008, however, that was not the case. “You had to give a notice to everyone on your street, and if one person said no, you had to shut down,” Pattison explained. Even if the legal environment is right, there can be other limitations to beekeeping in urban or suburban spaces. Though backyard beekeeping is permitted in Littleton and surrounding towns, Hudson Gardens & Event Center in Littleton, Colorado, started its community apiary in 2009 to provide a space for beekeepers facing other challenges. If you are lucky enough to have a community apiary near you, the best thing to do is to ask how to apply. Each community apiary has different rules and requirements to join. At Burgh Bees, Pattison said it costs $75 a year to lease a space for hives, and the organization asks that beekeepers conduct 20 hours of volunteer service during the year. “There are lots of work days in the large pollinator garden around the property, and we do a lot of outreach with schools and community organizations in the neighborhood,” Pattison said. Hudson Gardens & Event Center requires community service in lieu of a lease fee. Whether beekeepers meet the community service requirements helps the organization decide which beekeepers they will readmit from year to year. New beekeepers also usually have to take a training course before they can start at the apiary. Fedderson said that new beekeepers are required to take Hudson Gardens’s comprehensive beekeeping class series to be a part of the community apiary. According to Pattison, Burgh Bees requests that new beekeepers take a class as well, but they can take the class anywhere as long as they show proof of completion. Community apiaries gives beekeepers an opportunity to give back with their passion by educating the public about pollinators. Community apiaries are also great for cultivating a love of beekeeping with new beekeepers. Having a mix of new and seasoned beekeepers also helps promotes skillsharing and builds a community around beekeeping. What is square foot gardening and should you try it this spring?